To make your experiments easier, it is possible to copy, paste, cut, and insert BPR filters. Since ZBrush renders the result of each filter in order, it can be useful to change the order or to insert new filters. The filters Copy/Paste/Cut/Insert functions. Combined with the Load, Save and Freeze functions, they offer full control over filter management. After copying or cutting a filter, select the one that you wish to follow it in the render order. When you then insert the copied/cut filter, the selected one will be shifted to the right and the inserted filter will take its former slot position. Other filters located after the inserted one will of course also be shifted. Obviously, cutting a filter will also shift the positions of all filters which had been located after this removed filter. The Reset Filter function will restore all settings for the current filter to their initial values. Click on the F1 to F12 buttons to display the corresponding slot which can receive a filter. By default, no filters are activated. You must click on the small circle at the top right of the Function button to enable/disable the filter. For a list of the available filters see Filters List. Define how strongly the filter will be applied to your render. At 0, the filter has no effect, while at 100 it applies the effect at 100%. 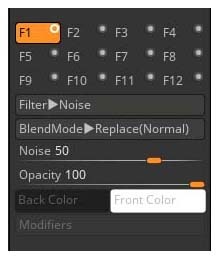 Negative values are also possible and will reverse the filter’s effect (such as turning the Blur filter into a Sharpen filter). The Strength slider will have the name of the selected filter. Define the amount of opacity the filter will be applied to your render. At 0, the filter will be fully transparent and have no effect, while at 100 it will appliy the effect at 100%. By clicking on the Front Color box you can change the color applied to the filter. Some filters like Red, Blue or Green are not affected by this option. By clicking on the Back Color box you can change the background color applied to the filter. Some filters like Red, Blue or Green are not affected by this option. 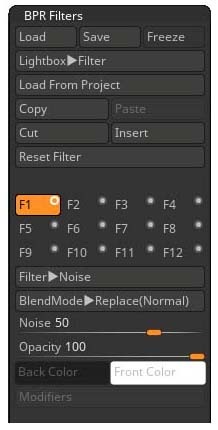 Some filters, such as the Texture filter, have Modifiers which can be accessed when this button is enabled. These are additional options for adjusting how the filter affects the render. Below the Modifiers button you can find a series of operators which modulate the filters’ effect based on various properties coming from the 3D model, color information or rendered elements like shadows. Changing their values will allow you to control whether the filter result is part of an element or discreet from it, such as having a filter affect only the render’s shadows. Of course, it is possible to combine multiple modulators through the Mask modulator, such as affecting only the shadows which fall on the model itself. 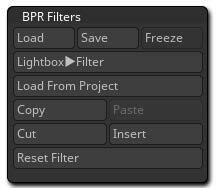 Read more about theses settings on the BPR Filter Modulators page.